Notes: Dixon #59. Bar Rep 53. Butler Vol. 1. Map 9.8 (photo on p.61, diagram Vol. 5. p.47). Grinsell WIDECOMBE 14. Lethbridge diagram p.129 and photo bottom p.129. Notes: NMR D. Turner A62. "Cairn built around tor. Diameter 25 metres, height 4.0 metres." "Ring cairn, internal diameter 4.5 metres, with bank 1.0 metre wide and 0.4 metres high. In the centre is a boulder 3.0 metres wide, 2.0 metres thick, 2.5 metres high." Notes: Turner F1. A cairn from 0.8m. to 1.2m. high, with a minor central excavation 0.5m. deep. The kerb retaining circle extends round the west and north quadrants. Notes: NMR C. "Cairns on Top Tor. 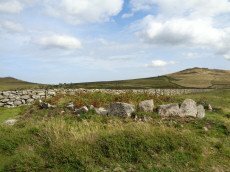 Two inconspicuous cairns lie about 80 metres apart beside the track which follows the crest of the ridge on the north side of Top Tor. 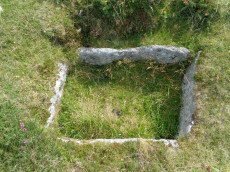 The cairn to the south is smaller at circa 7.5 metres diameter by 0.2 metres high and has a circle of ten slabs showing above the turf around the edge. 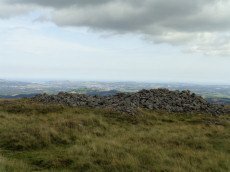 This cairn has been reported to have a stone row running downhill to the north but the few earthfast slabs in this direction are no more numerous than elsewhere on the hillside and this seems unconvincing. Nearly 100 metres east of the southern cairn is an arc of three standing and two flat slabs representing about a quarter of a circle. The interior is quite flat except for a shallow trench but possibly the stones originally surrounded a cairn which has been completely removed. Other details: Map 9, Site 7."